No one was seriously injured in a rollover accident on Rosemount Road early Friday afternoon. Matthew Bailey, 33, of South Webster failed to negotiate a curve on wet roads and rolled into a ditch according to Trooper Travis Stump of the Ohio State Highway Patrol. Bailey and a passenger, Rachel Blevins, 29, of Cattletsburg, Ky., both refused treatment. Stump said Bailey was charged with failure to control and driving under a suspended license. 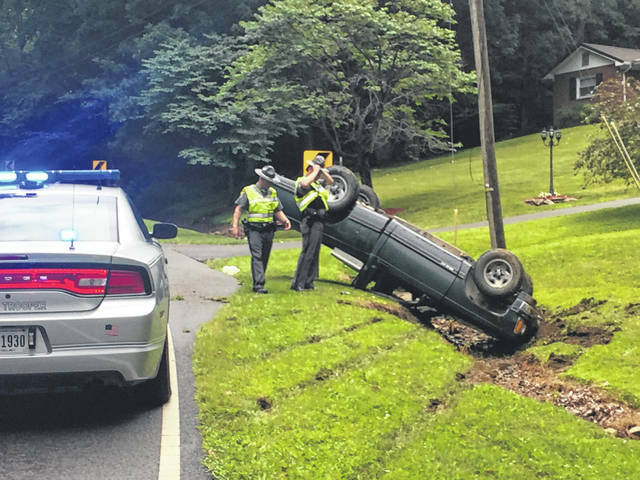 https://www.portsmouth-dailytimes.com/wp-content/uploads/sites/28/2018/07/web1_IMG_2634.jpgNo one was seriously injured in a rollover accident on Rosemount Road early Friday afternoon. Matthew Bailey, 33, of South Webster failed to negotiate a curve on wet roads and rolled into a ditch according to Trooper Travis Stump of the Ohio State Highway Patrol. Bailey and a passenger, Rachel Blevins, 29, of Cattletsburg, Ky., both refused treatment. Stump said Bailey was charged with failure to control and driving under a suspended license.